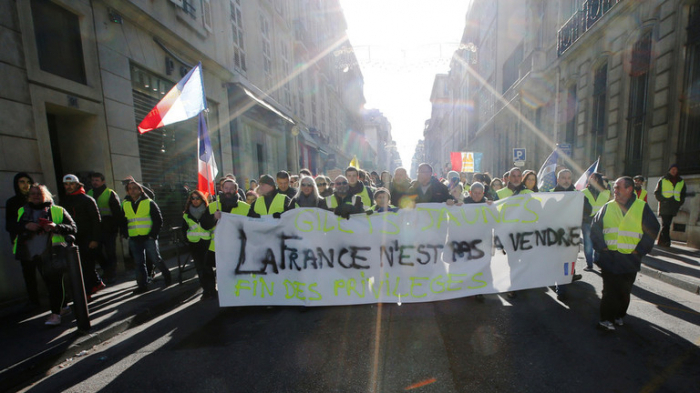 A well-coordinated financial action has the potential to bring the French banking system – and by extension the euro – to its knees, as banks always hold only a fraction of the funds the country’s citizens have in their accounts. However, most banks limit ATM withdrawals to a relatively low amount, meaning protesters would have to line up inside the banks to withdraw the rest of their money, giving the state plenty of time to place restrictions on withdrawals – though this would, no doubt, spark further protest. The financial demonstration is a novel means of circumventing Prime Minister Edouard Philippe’s proposed crackdown on “unauthorized protests,” announced earlier this week after a particularly violent weekend of clashes with armed riot police – including an unexpected appearance by boxer Christophe Dettinger. Philippe has promised 80,000 security forces will be deployed for the next protest. Meanwhile, there is tension within the movement itself, as some former protest leaders call for a political solution. The government has urged the protesters to make their voices heard in a national debate instead of demonstrating in the streets as they have done for the last two months. The debate, scheduled for next week, will cover climate change, “democratic issues,” taxes and public services.